At FLVS, professional learning matters. Learning that is student-centered, collaborative, sustained and data-driven is what drives success. This is the year that every department and individual at FLVS is going to refocus. For our teachers, being able to identify and articulate professional learning goals directly impacts student learning, mastery, and performance. This is what student-centered professional learning is all about. 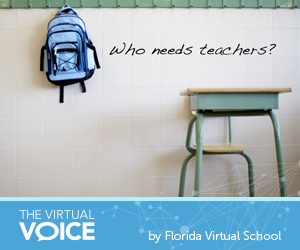 Whether teaching students directly or supporting those who do, what every staff member does at FLVS in their day-to-day responsibilities impacts student success! All of our personal goals are tied to our department’s functional goals. They also align back to the organization’s strategic goals so we each have a clear picture of how we are contributing to our overall mission of student support and achievement. For FLVS instructors and support staff, this looks like the work we do every day…participation in lesson studies, action research, and work on collaborative business goals or projects. Our individual learning also matters to our peers. Our goal is to grow individually and together as a team. In an effort to make learning stick, learning should scaffold and connect. At FLVS, Professional Learning is not a “one and done” list of topics throughout the year. Learning needs to be sustained – ongoing with the intention of building skills over time. Everything starts and ends with data. Our staff looks at data before choosing an area of professional learning. The reason an instructor or staff member participates in professional learning is always directly tied to student achievement or a departmental or organizational need by looking at data. But we want to go full circle. If we use data to identify a need, then we need to use it to show movement in our students’ learning or mastery after we apply what we have learned. Or alternatively, it is used to show an improvement in departmental procedures, the creation of an efficiency, or an innovation in product or service. What kind of teachers do students need? This entry was posted in Educator Edition and tagged Careers, Careers at FLVS, Educators, Online Education, Online instruction, Professional Development, Professional Learning, Professional Learning Standards, Tips for Educators on February 25, 2015 by Mary Mitchell. Students need teachers who are willing to take responsibility for student learning and achievement…so true! Grateful to work with educators who do exactly this every day for all students!! Thank you teachers- your learning matters, and the difference you are making matters! !